Europa zur Zeit Carl's des Grossen. 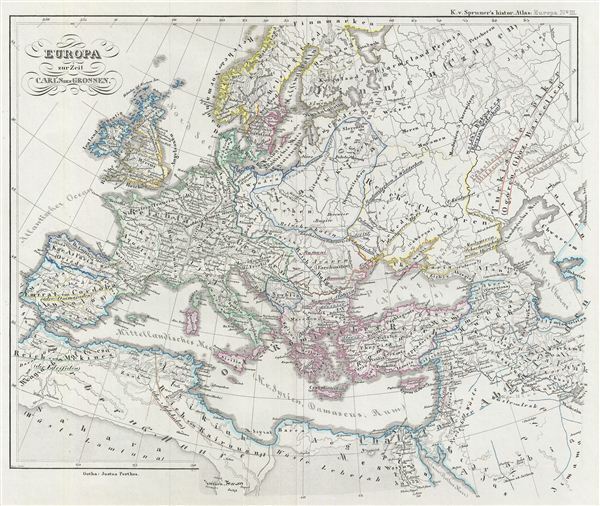 This is Karl von Spruner's 1854 map of europe at the time of Charlemagne. The map covers all of europe from Sweden south as far as Africa and from Portugal to the Caspian Sea in the east. After ruling and reforming France in 768, Charlemagne conquered Italy and, in 800, was crowned Holy Roman emperor. For the next 14 years until his death, Charlemagne's empire united much of Western and Central europe for the first time since the collapse of the Roman empire. The ‘Carolingian Renaissance' witnessed a Catholic themed revival of art, religion, and culture, encouraging the formation of a common european identity. The whole is rendered in finely engraved detail exhibiting throughout the fine craftsmanship of the Perthes firm. Prepared by Karl Spruner for publication in the second edition of Justus Perthes' 1854 Historich-Geographischer, Hand-Atlas zur Geschichte der Staaten europa's vom Anfang des Mittelalters bis auf die Neueste Zeit.